Storks sit in their nests in Zywkowo village, northern Poland on August 8, 2013. More than 15,000 White Stork couples flock to the lake-rich northern region of Masuria every summer, according to local officials. It is a success story of happy coexistence: outnumbered by storks, residents of the Polish hamlet of Zywkowo welcome the birds on their roofs in exchange for good luck and, if you believe legend, newborns. Kept afloat by EU and non-profit funding, the northern hamlet—a stone's throw from the Russian exclave of Kaliningrad—depends on storks for the tourism it needs to survive. "In the 1960s, we had 120 residents and 20 storks. Today it is the opposite," says retired farmer Wladyslaw Andrejew. While too poor to keep the younger generation from leaving, this part of the country is paradise on earth for the large, red-legged birds. More than 15,000 White Stork couples flock to the lake-rich northern region of Masuria every summer, according to local officials. Poland as a whole sees an average of 50,000 storks a year, or 20 percent of the world's population. Since he was little, 64-year-old Andrejew has been passionate about storks, building and fixing massive nests for his animal pals on roofs, in trees and on poles around the farm. He has counted them, gawked at them, fed them and protected them. In 2004, a record year, he counted 27 stork couples on his farm, plus 38 babies. "Storks are like nature in general: you have to put your heart into it. Then they'll bring good luck," he says. "We've always lived under the protective wing of the stork and have never known misery." 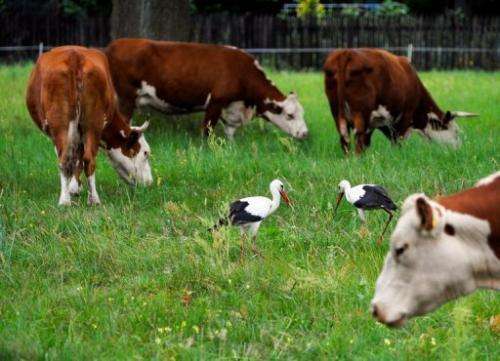 Storks stand next to cows on a meadow near Warsaw on August 18, 2013. Kept afloat by EU and non-profit funding, the northern hamlet of Zywkowo depends on storks for the tourism it needs to survive. Every April he impatiently awaits the sound of the storks' noisy bill-clattering—akin to machine gun fire—as they fly in from Africa. "In winter, when the storks are gone, the silence is awful," Andrejew says. "Come spring, the back of our necks wrinkle as we lift our heads towards the sky to scan for the first arrivals. In autumn, we cry to see them go." When he retired, Andrejew sold his farm to the bird protection society PTOP, a non-profit organisation based in the northeastern city of Bialystok. Using the farm as a local base has allowed PTOP to launch a series of projects aimed at welcoming storks into the area. "We harvest hay, dig ponds, put up new platforms for their nests, fix the old platforms, insulate the electric lines for the birds' safety," says farm manager Adam Lopuszynski. "We bought these aerial lifts firemen use, which help us reach and repair the big nests up high." A stork's nest generally weighs around 500 kilogrammes (1,100 pounds) but can reach up to quadruple that, or two tonnes. PTOP acquired a total of 75 hectares (185 acres) of land around Zywkowo and planted a mishmash of crops as that's what the bird prefers. 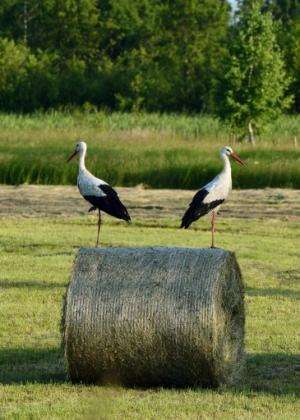 Storks stand on a straw bale near Warsaw on June 20, 2013. Poland as a whole sees an average of 50,000 storks a year, or 20 percent of the world's population. "Storks set up camp wherever there's a mosaic of plots of land," Lopuszynski says. "We want to show that if we take care of nature, we can live side by side with the stork," adds the former sociologist turned bird-watcher. Zywkowo's three-year stork protection programme, which was cofunded by the European Union and ends this year, cost around 1.5 million euros ($2 million), according to PTOP official Sebastian Menderski. "We do everything with the stork in mind. It's all for the bird," he says. "The area's future depends on the stork. If all the young people leave, our hamlet will disappear," adds mayor Stefan Hryszko. 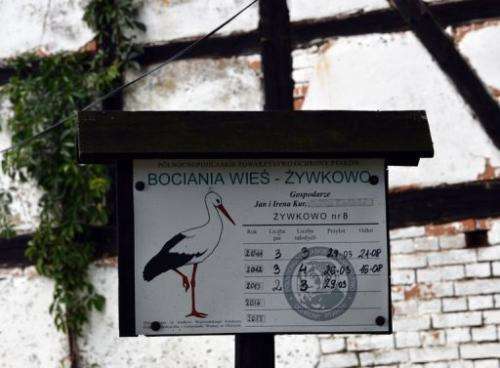 A sign at a farm in Zywkowo displays the number of stork couples, chicks and the birds' arrival and departure dates, on August 8, 2013. 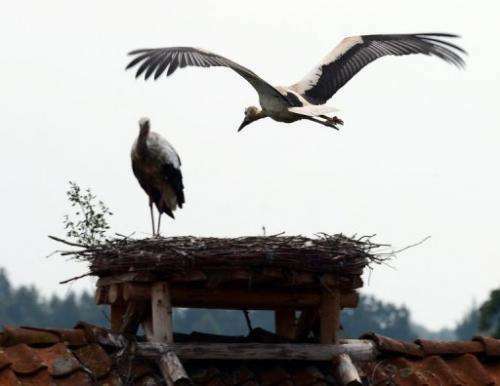 Zywkowo's three-year stork protection programme cost around 1.5 million euros, according to PTOP. "Thanks to the stork, there's investment, there are jobs and there's construction. That will keep us around." Plus, "it's the storks who bring newborns!" jokes Andrejew, father of five, citing an ancient legend still used in advertising, storybooks and popular imagery today. "Some even say it's enough for a woman to look at a stork to get pregnant."